Check out all the Krazy deals we found for April 2019. April showers bring May flowers and also the dreaded spring cleaning. Now is the time to start packing away those winter clothes. You can find many deals on storage totes, organization and cleaning supplies. April is also a great time to replace your vacuum cleaner. I know buying a vacuum isn’t necessarily the most exciting purchase you'll make, but it can be less painful when you’re taking advantage of a spring cleaning sale. Easter is Sunday, April 21st this year and when Easter is done and over, leftover candy and Easter related products will be deeply discounted. Also with winter finally over (for some of us..lol), it’s the perfect time to get active again and there will be many deals on sneakers and activewear to help you out. Consider this your reminder and extra motivation to keep working towards those fitness goals you set in January! Keep going, YOU GOT THIS!! Surprisingly tires also go down in price around April, so if you need to replace them, April is a great month to find Krazy Deals on some new tires. Also, FYI Mother's Day is right around the corner coming up on Sunday, May 12th to be exact, so some April deals would work out well too, as small appliances and jewelry tend to be discounted in April. April definitely has its fair share of spring deals and discounts. Other dates to remember coming up in April are Tax Day on Monday the 15th, Earth Day on Monday the 22nd, Administrative Professionals Day on Wednesday the 24th and Arbor Day on Friday the 26th. Please be sure to pay attention to the Good Through Dates that have been included with each deal posted. If no Good Through Date is included that means this is an ongoing promotion with no end date listed which is subject to change per retailer. 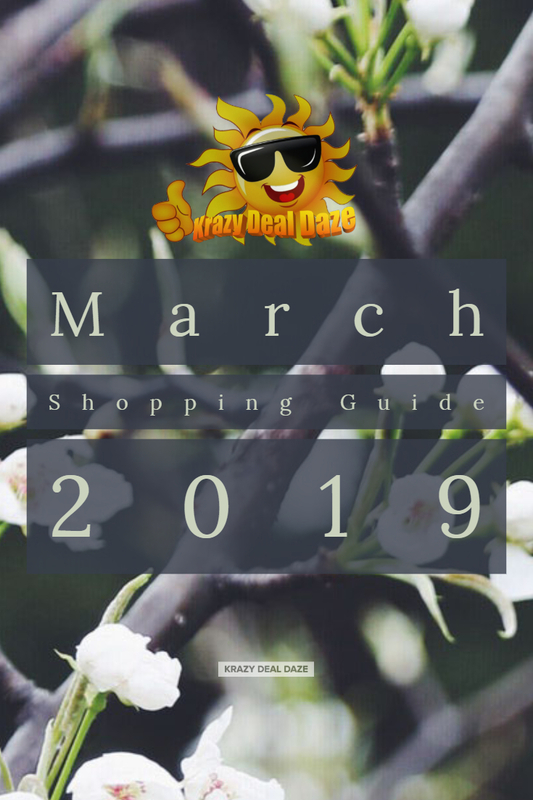 Some of these dates and deals aren’t here yet and are coming up this month or depending on when you’re reading this, those dates may have already passed. 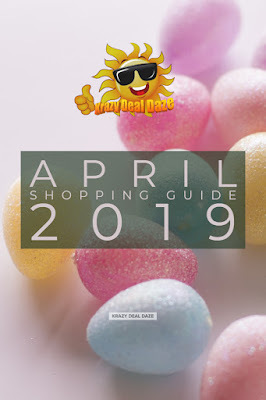 Here are some of the deals we have found for April 2019. So let the deal hunting begin!! 2. Check out all the Easter goodies at Amazon’s Easter Shop! 1. Shop the Ultimate Gift Guide All Year Long at Walmart.com! 2. Free Shipping at $75. Shop now at Macys.com! Offer Good 3/24/2019 Through 4/11/2019. 4. Take 20% off Easter Sale + Free Shipping at $75 with code SALE. Shop now at Macys.com! Valid 4/15-4/22. 2. FREE* Shipping To a Dollar Tree Store! Pick It Up At Over 5,000 Locations! *Restricitons may apply. 1. Save on Your Trip to Athens, Greece! Get up to $40 off when you book with promo code ATHENS40 Book Now! Offer Good Throughout 2019! 1. Get Free Dental Kit worth $20 with 12 Doses of Revolution! Now Enjoy 5% Extra Off + Free Shipping! 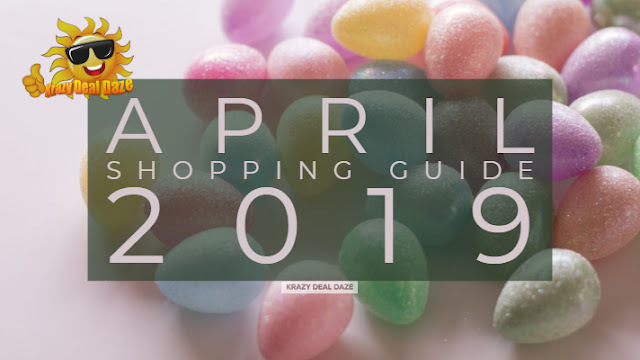 Thank you for stopping by and checking out our April Shopping Guide! Which Krazy Deal are you most excited about this month? Be sure to let us know in the comments below! Check out all the Krazy deals we found for March 2019. Although there aren’t any major shopping holidays in March, March winds will still be blowing in some fabulous deals. Valentine's Day has passed and there will be 50%+ on already discounted candy and decor. If outdoor grilling is something you enjoy, this is the best time to stock up on all your essential supplies, such as that dream grill you've always wanted. After all those sweets and grilling, exercise equipment will be a good buy as well. Many stores have great deals available. Now that winter is winding down you’ll come across some amazing deals on riding and push mowers, just in time for spring. After all the first day of Spring is just right around the corner, the 2019 Spring Equinox falls on Wednesday, March 20th. March is also National Frozen Food Month, so be on the lookout for awesome deals to stock up on. Winter clothing sales will still be going strong in most stores to get ready for spring and summer lines. It would be a great time to snag some deals on coats, sweaters etc. Of course, Saint Patrick's Day is coming up on Sunday, March 17th so look for deals throughout the stores as they tend to have sales around any holiday, even St. Patty's Day! Department stores and online retailers will usually discount their selection of green-themed clothing, party supplies, and jewelry. Lastly, March is traditionally the month when spring cleaning officially gets started, it's also a great time of the year when you can do more than just declutter. It's also a great time to buy materials for your upcoming home renovations. Please be sure to pay attention to the Good Through Dates that have been included with each deal posted. If no Good Through Date is included that means this is an ongoing promotion with no end date listed. Some of these dates and deals aren’t here yet and are coming up this month or depending on when you’re reading this, those dates may have already passed… Also, you may want to bookmark this page so you can check back regularly as we will be updating this guide as we find more deals throughout the month. Here are some of the deals we have found for March 2019. So let the deal hunting begin!! 2. Take 20% off 1,000's of Specials + Free Shipping at $75 with code SHOP. Shop now at Macys.com! Valid 3/6-3/10. 3. FREE SHIPPING On All Yoga Pants, Bras & Tanks At Gaiam.com! Good On all Orders Over $75! Click Here! 1. Free Shipping at SallyBeauty.com on ALL Orders $25+! 2. Shop. Earn. Redeem. Repeat. Join Sally Beauty Rewards: Earn $5 just for signing up! 2. Revolution is a multi parasitic preventative, which kills fleas, flea eggs, flea larvae, eliminates gastrointestinal worms and prevent heartworms. 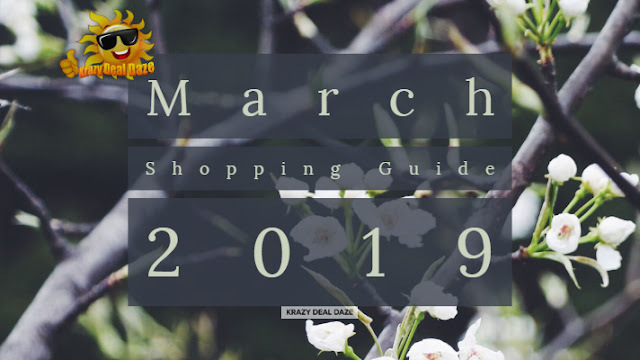 Thank you for stopping by and checking out our 2019 March Shopping Guide! Which Krazy Deal are you most excited about this month? Be sure to let us know in the comments below!